What is a Stem Cell? The National Institute of Health defines a Stem Cell in this way: “Stem cells have the remarkable potential to develop into many different cell types in the body. Serving as a sort of repair system for the body, they can theoretically divide without limit or replenish other cells as long as the person is still alive. When a stem cell divides, each new cell has the potential to remain either a stem cell or become another type of cell with a more specialized function, such as a muscle cell, a red blood cell or a brain cell”. 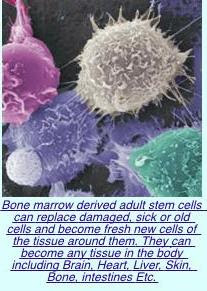 Adult Stem Cells are predominantly formed in the bone marrow. And, just as in the beginnings of life, adult stem cells can literally change into any type of cell in the body throughout life. The adult stem cells are released from the bone marrow into circulation in the blood stream to seek out problem areas, then renew and restore those areas. Example: The Heart When circulating stem cells find the heart in reduced health, they exit the bloodstream, attach to the heart and actually become brand new heart muscle cells, analogous to the original cells that originally created the once infant heart. They then begin dividing into still more new heart muscle cells. The same with the liver, the kidneys, the brain, the skin, eyes, any organ, tissue, muscle, bone, connective tissue – literally any part of the body that is in need of restoration. How do Stem Cells affect my health? The National Institute of Health identifies 74 treatable diseases using adult stem cells in therapy. These costly and complex therapies typically deliver a large quantity of adult stem cells to the area undergoing treatment. Most require that stem cells be harvested from the patient or adult donor, programmed in a lab to become a specific type and cell and then injected into the body. For treatment of disease these therapies are many times the best method of recovery, producing truly remarkable results. Thankfully, most of us don’t have issues that require these extensive procedures. According to medical science, adult stem cells assist in: Cancer; leukemia, auto immune disease including diabetes, lupus, crohn’s disease and arthritis; cardiovascular disease, including acute heart damage and chronic coronary artery disease; corneal regeneration; parkinsons, stroke; anemias and other blood conditions; liver and blood disease. For those of us just wanting to maintain optimal health or fight the effects of aging, injury and day to day wear and tear, a smaller but steady release of our existing stem cells into the blood stream can produce considerable health benefits. When stem cell nutrition is used as a daily supplement over time, the stimulation of billions of additional stem cells in the blood stream could be one of the safest and most efficient methods for maintaining optimal health that science has yet discovered. Sports Performance, Recovery and Stem Cell Nutrition. Young, old, weak, strong, elite athlete, casual athlete, non-athlete, someone recovering from injury, everyone enjoys having strength, flexibility and stamina. For professional athletes and the weekend warriors fast healing and complete recovery is in demand. The opportunities for Stem Cells to enhance this procedure and shorten time-frames for recovery are becoming evident. The numbers of your own stem cells available in your body can be enhanced by an average of 25% within 1 hour. Adult Stem Cells – the best anti-aging system ever known. Knowing what adult stem cells do in the human body, dosen’t it make sense that having more of them in the blood stream will undoubtedly have profound effects on your health, wellbeing, and provide an until now, untapped resource for fighting the effects of aging? He could not have known then that in 2006, stem cell technology would provide a product as simply as a daily supplement in capsule form that would directly stimulate stem cells in the manner he was describing. The documentation of adult stem cell function by mainstream science and medical research are virtually endless. The previous are just a fraction. To find more, just visit the science and medical community’s online source for retrieving such papers and articles – www.PubMed.org. Type stem cell in the search box and have access to more than 150,000 studies. Adult stem cell will yield 30,000+ papers. The Circulation System and Adult Stem Cells. One of the main factors that inhibit our micro circulation is fibrin. What is Fibrin? Fibrin is an insoluble protein that makes up a blood clot by forming a network in which red blood cells and platelets are trapped. A Blood clot is formed by the action of thrombin on fibrinogen, this is a normal function and very essential. BUT, when there are free radicals in our blood from oxidative stress, the free radicals act in a similar way to thrombin and cause fibrin threads to appear in the blood. It is Fibrin that can slow down and inhibit our fine circulatory blood vessels. It is important to know how common the presence of fibrin is. If you are 30 years old and live an average Australian/New Zealand life it is most likely that you will already have detectable levels of fibrin affecting your microcirculation. Remember this is affecting the red blood cells ability to exchange oxygen and carbon dioxide, and your body’s ability to absorb nutrients and transfer adult stem cells at a cellular level. wikipedia states: In humans, oxidative stress is involved in many diseases, such as Atherosclerosis, Parkinson's disease, Heart Failure, Myocardial Infarction, Alzheimer's disease, Fragile X Syndrome and Chronic Fatigue Syndrome. A proprietary blend of herbs and all natural ingredients that support optimal blood circulation by reducing fibrin and oxidative stress in the blood, detoxifying the blood and improving overall blood flow and reducing Oxidative stress. Mangosteen - An extraordinary fruit originally from Southeast Asia that is well known for its antioxidant properties. Cat's Claw - Also called the 'Sacred Herb of the Rainforest', this tropical vine which is found in the jungles of the Amazonian Basin, provides potent unique antioxidant support. Curcumin - Extracted from the Turmeric plant, curcumin has been used for centuries in Southeast Asia to help cleanse the blood and detoxify the body. Silicate - Rich in minerals, silicate has been shown to have strong antioxidant properties to help reduce oxidative stress. By helping to keep the highways and byways of our circulatory system free and clear, this product supports the smooth 'trafficking' of stem cells everywhere in the body. In clinical studies, the stem cell flow enhancer was shown to improve blood circulation within thirty minutes of consumption. The study showed increased blood circulation in capillaries as well as substantial reduction in blood markers associated with fibrin production and oxidative stress.